Metso will showcase its industry-leading technology and service solutions at MINExpo INTERNATIONAL® 2016. The new solutions to be presented are focused on eliminating unplanned downtime, reducing expenses, and increasing productivity. The event takes place in Las Vegas, Nevada, USA, September 26 to 28. "We are excited to participate in MINExpo 2016 and to share our decades of experience delivering equipment and systems designed to maximize uptime," says Terry J. Wilkins, Senior Vice President, Market Areas USA & Canada. "Having deep insight into today's complex mining operations means that we can give our customers a sustainable plan of action to keep their business growing profitably. At MINExpo, we're highlighting specific products and services designed to eliminate unplanned downtime, increase productivity, and improve safety." To help mines reduce costs and emissions as well as improve safety and productivity, Metso is introducing a comprehensive portfolio of in-the-pit crushing and conveying solutions ranging from stationary installations to fully mobile Lokotrack® plants and Lokolink(TM) conveyors. Using in-the-pit solutions to reduce or replace conventional truck haulage saves both energy and money, while delivering increased capacity, economy, and reliability. Life Cycle Services (LCS) take the entire range of services Metso provides and conveniently bundles them into customizable, simply managed packages. These packages can range from the basics of supply and inventory management to more complete maintenance or operations solutions tailored to the needs of the customer. With newly added enhancements to be launched at MINExpo, Metso's LCS packages can help customers significantly reduce downtime and operational costs. Metso's new generation of crusher upgrades aim to improve the safety and productivity of older models. Maintenance costs can be significantly reduced and crusher uptime increased through improved component design, extending service life and simplifying maintenance. The new generation of upgrades can be fitted to several of Metso's heritage branded crusher models, such as Symons™. 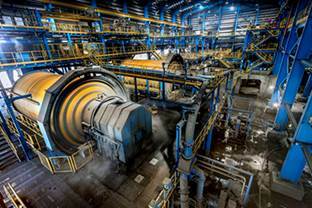 Metso will introduce its new MHC(TM) Hydrocyclone and UltraFine(TM) Screen at MINExpo. These new products will make it easier for customers to adopt world-class wet fine classifying technologies to improve efficiency and profitability. Both products position Metso as a unique supplier of fine classification technologies designed to optimize mining applications. This major mining event will also see the launch of Metso's heavy-duty MD Series mill discharge pumps for slurry pumping applications. In addition to these new products, Metso will present its energy-efficient comminution solution, combining the HRC(TM) high-pressure grinding roll with proven Vertimill® stirred milling technology. Metso will also highlight its extensive offering of OEM spare and wear parts and regional service centers strategically located around the world and providing excellence in high-quality OEM aftermarket repair service. For more information about Metso's range of advanced products and services for the mining industry, please visit us at MINExpo in the North Hall of the Las Vegas Convention Center, Booth 1943, or online at: www.metso.com/MINExpo2016. Caption: The theme for Metso's display at MINExpo International 2016 is Welcome to uptime. The new solutions presented at the event are focused on eliminating unplanned downtime, reducing expenses, and increasing productivity.